League Two champions Swindon Town have received a financial boost of around £2m from existing investors. 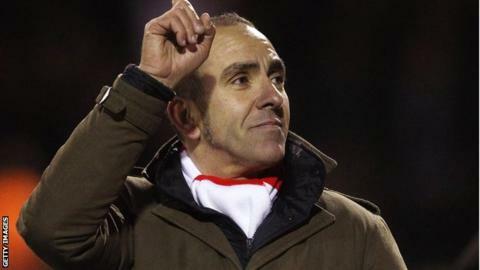 The club have said the majority of the money will go towards manager Paolo di Canio's playing budget - thought to be around £4m this season. Some of it has already been spent on their seven summer signings. The Robins are also seeking additional funding from external sources to aid their plans to redevelop their County Ground home. "When things are on the up you've got to capitalise," chairman Jeremy Wray told BBC Wiltshire. "We seem to be getting things right on the pitch at the moment and I think it's the right time to push ahead with the plans we've talked about for a long time." The League One outfit are looking to redevelop the Town end of the their ground - which would increase the capacity by 4,000 - and are also in discussions about erecting a hotel to create what Wray describes as a "gateway" to Swindon. "We're not property experts but there might be people out there who are, who might want to come on board and help us develop the County Ground," he continued. "It's not cheap - we've discussed not only what we do with the ground but also what we do with the surrounding area. "It's about taking the whole thing up a level. It is expensive and it does require expertise from partners that know how to deal with these things." Wray confirmed the development could start as soon as 2013, as the club look to fulfil their ambition to secure back-to-back promotions.